Early this morning, the U.S. Congress passed the Consolidated Appropriations Act, 2018, a $1.3 trillion bill that will fund the U.S. government through the end of the current Fiscal Year 2018 (FY18), which ends on September 30. President Trump signed it shortly thereafter. In a bipartisan effort, members of both the House and Senate soundly rejected nearly all of the Administration’s proposed deep cuts in science and research—and went further by providing some of the healthiest funding increases seen in years. For more information on science and research funding in the FY18 federal budget, click on the graphic (at right) for a summary from the American Institute of Physics or see this overview from the American Association for the Advancement of Science (AAAS). Overall, AAAS’ quick analysis is calculating the total amount in the budget for scientific research and development at about $177 billion for FY18, more than 18% above the Administration’s request and 13% higher than in FY17. The National Science Foundation (NSF) will receive about $7.8 billion, 24% more than the Administration’s request and a 4% increase over FY17. NSF’s Directorate for Education and Human Resources will have a budget of about $900 million, or 19% more that the President wanted and 3% over the FY17 budget. The National Aeronautics and Space Administration (NASA) is looking at a FY18 budget of roughly $20.7 billion, up 9% over the Administration’s FY18 request and 6% beyond last year’s budget. Proposals to eliminate the NASA Office of Education in FY18 failed. The National Institutes of Health (NIH) will see a FY18 budget of about $37.3 billion—39% more than the Administration’s proposal and a 9% increase over FY17. NIH’s National Institute of General Medicine Sciences, which includes the Science Education Partnership Awards, is expected to receive a 5% increase over FY17. At the National Oceanic and Atmospheric Administration (NOAA), the main research section—the Office of Oceanic and Atmospheric Research—will have a FY18 budget of about $515 million, a 57% increase over the President’s request and a 7% rise from the FY17 budget. 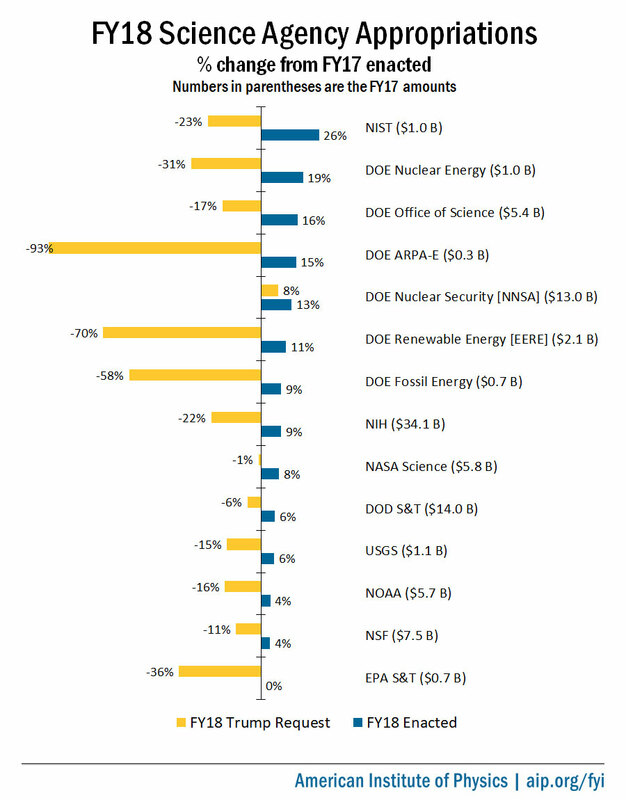 Climate research is flat-funded in FY18, even though the Administration and the House had originally recommended deep cuts. Below are some of the additional details in the FY18 budget, for programs specifically related to informal STEM education programs and other programs of interest to science centers and museums. ASTC and its Public Policy Committee deeply appreciate the efforts of everyone who contacted their elected officials during this year’s budget process, pushing for strong funding for science, research, and education. And now the battle for FY19 begins!